Three weeks ago we reported that in the first nail to its investment grade coffin, GE had found itself completely shut out of the Commercial Paper market when Moody's downgraded its senior unsecured rating to Baa1, from A2, and downgraded the short-term rating to P-2, from P-1, making future sales of CP impossible. So, in lieu of CP access, GE said it would replace that funding with a net $40.8 billion of available credit facilities committed from banks. Or, as we explained "GE will now use its revolver, which carries a higher interest rate, to fund what it previously achieved using CP." This transition in GE's reliance from commercial paper to revolver is not just a problem for GE, however, which now faces higher funding costs and encumbered assets: with the industrial conglomerate's business and operations deteriorating rapidly, GE has become a major headache for America's largest banks almost overnight. As Bloomberg reports, the five biggest Wall Street firms have committed to lending at least $3.5 billion each to GE even as the industrial giant is facing rising concerns about its viability and the sustainability of its debt. As we reported on Halloween, GE has almost $41 billion in credit lines it can draw from, and according to Bloomberg, when fully tapped, GE's two main credit facilities would rank as the largest loans to any U.S. company that go beyond next year. The good news for GE, is that so far it has only used about $2 billion of the available credit by the end of the third quarter, leaving itself ample room to pull more if necessary. That's also the bad news for the big banks who are contractually obligated to provide GE with an additional $39 billion in liquidity. Indeed, companies typically draw down heavily on their credit lines when facing funding shortfalls. Earlier this month, investment grade-rated, yet extremely troubled California utility PG&E fully used its credit facility, sending its stock plunging even as its investors worried the company might lose its investment-grade credit rating or face liability related to wildfires ravaging the state. 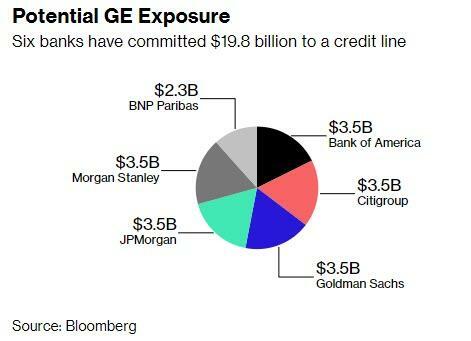 Bloomberg notes as much, saying that from GE’s perspective, the unused credit is a crucial backstop as analysts voice concerns about the risk of a funding shortage. Chief Executive Officer Larry Culp has been selling assets to raise cash and is under pressure to raise more through a stock offering. The untapped credit “gives us a foundation” as the firm takes steps to reshape itself and ultimately reduce its borrowings, he told CNBC this month. From the banks’ perspective things are not nearly quite as rosy as the possibility of a draw-down by a borrower shut out of other funding sources poses serious liquidity risks, "including default if the company ultimately proves unable to manage its obligations." Meanwhile, the cost of GE default protection has soared with CDS now trading at 250bps, up from 50bps 2 months ago, signaling not only the possibility of further cuts to GE’s credit rating and higher costs for new borrowings, but - unthinkably - a default. As a reminder, GE was downgraded by the two biggest rating firms last month, ending up three grades above junk; more downgrades are imminent. Bloomberg has some more details on GE's revolvers, which the company divided into three categories at the end of September. The main one includes a $19.8 billion credit line from six banks, which expires in 2020. Then there’s a $20 billion backup facility from 36 banks expiring in 2021. The third group is a collection of credit lines arranged individually with seven banks, expiring between February and May of next year. While GE doesn’t identify the three dozen lenders in the backup facility or specify how they are splitting their commitment. JPMorgan is among members of that group, so is Wells Fargo & Co., which isn’t one of the lenders named in the first line. Such commitments can make up an outsize chunk of a bank’s portfolio. Morgan Stanley’s share of the first GE facility amounted to 6 percent of its investment-grade lending commitments at the end of September. At Goldman Sachs Group Inc., it was 4 percent of the bank’s high-grade book. Of course, Gorman knows that he is right only as long as GE retains its investment grade rating; once it is junked - and the great and inevitable "fallen angel" avalanche begins all bets are off. Still, there are limits to banks’ exposure. According to Bloomberg, GE’s filings show there are offset provisions for firms participating in both syndicates, potentially preventing the company from tapping the same lenders twice. Also, banks hedge themselves against losses from big borrowers by buying credit derivatives that act as insurance.